Apart from its reputation of having excellent catering and food display, we fell in love with the Grand Hotel Excelsior for its beautiful and rich decor. From the first meeting with the Events Organiser we were sure that our wedding would be the promised unforgettable experience. The venue could not have been set better. Everything was more than we had wished for. Staff treated our guests in the most professional way possible. Entering the venue was surely the most memorable moment of our day. Even from the video, our faces showed total awe firstly for the wonderful and elegant wedding cake but also for the display of each and every item professionally prepared for which we had thoroughly discussed with our kind organiser. Everyone complimented the choice and exquisite food. Our guests still congratulate us for the elegant yet intimate setting we created together with the Excelsior staff. They really lived the grand life thanks to the excellent service. We can simply say that should we turn back time and do it all over again, we would not change a single thing… let alone our venue! It was one of our greatest investments not only for the day preparations but also for the whole process. During the preparations, before and also after the wedding, staff was always ready to meet us and speak to us. Our wedding was treated as the most important event happening in their hotel until the very end. We chose the Grand Hotel Excelsior after falling in love with the wonderful sunset view at the Admiral’s Landing. Getting married in February meant that we required a controlled environment with all the benefits of being outdoors, that is, having a great view and a spacious atmosphere. The Admiral’s Landing was spot on; it had a beautiful view of the harbour to show off to our foreign guests, one spacious area for guests to mingle without being split into groups, the lovely marble bar in the middle for people to come together, a specific wine bar area and ample space for dancing. In choosing the Excelsior, we were also confident that the food served would go beyond the norm. Our expectations were wholly exceeded. Having waited for us to get married for ten years, our guests expected the very best. We chose the Excelsior because we were confident that they were up to it and we were proved right. The delectable minute detail in the food items, both savoury and sweet and the educated bar and waiting staff supervised by Peter from the very beginning to the very end, culminated in so beautiful an event that our guests continue to comment that our wedding was the most perfect they have ever been to. We particularly reminisce fondly about the dancing. We chose a long wedding to enjoy dancing and enjoying our guests. The set-up of the band and the spacious dance floor area allowed us to enjoy over 3 straight hours of frivolity. We continue to bring back the memories, it was so much fun and absolutely a great party. Not only do our guests recall their absolute satisfaction with all aspects of our wedding, but they repeat their fascination as being so pampered. They had praise for all the staff at the wedding, acknowledging the good manners, correct serving and supervision by Peter. The food was hailed as the most innovative and perfectly tasty that they have ever had at a wedding. Every single person giving us feedback was amazed at how it was pulled off in such perfect harmony that they would remember our wedding as the milestone of events. We would definitely recommend investing in an event organised by the Excelsior team. The ability to put one’s mind at rest that everything will really be not only all right but wonderful is a godsend. While we thank all the staff who worked so hard to be efficient and so professional, we most of all would like to sincerely thank Peter for all his patience from day one until after the wedding; our wedding would not have turned out like the fairy-tale it did without him! We chose The Grand Hotel Excelsior as we wanted an elegant and warm venue that offers great service, with an innovative, flexible menu and high quality executed food. The hotel also offered good parking space for our guests and located in Floriana makes it a central venue for guests. The venue we chose was also a consideration we made with a beautiful view having Manoel Island and its surrounding as backdrop to the ballroom’s balcony. Moreover the close proximity of the ball room from the hotel’s main entrance was also one of the reasons for choosing the Excelsior as this gave a certain intimacy and secluded our wedding from the rest of the hotels operations, giving a personal and warm welcome to guests and to us the bride and groom. 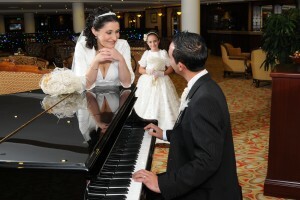 We were very happy with the service provided as we had a good team helping us make our day. The venue was also decorated with Christmas decorations as we got married on the 8th of December. The most memorable moment was when we both met at the altar and Ian, the groom lifted my veil. The ceremony remains engrossed in our minds as it was truly personal and intimate. However the cherry on the cake was when we got to the hotel and saw that everything was set-up as planned and imagined. Thus, every little moment and the whole day per Se was memorable for us. All our guests had positive feedback for the venue, food and service. The venue, having ample parking space was a big plus. Moreover all the guests enjoyed the set up of the venue as it gave everybody the opportunity to drink, dance and eat. It was simple yet elegant, fun and warm. Everybody complimented the food to be original, well-balanced, having meat and vegetarian delights as well as delicious. They also commented on having a good flow of food going around, giving them the opportunity to taste most if not all menu items. The cheese table was a great highlight and guests till this day still mention the abundance and greatly set up variety of cheeses and dips that made up this table. Everyone seemed to be pleased with the service provided by Excelsior’s great team of people. I would definitely recommend the Grand Hotel Excelsior as they give a personal service from the pre-booking phase to the actual day itself and after. The team is composed of dedicated individuals who make their utmost to make your day, special and memorable. They guided us into making the most out of it and on the day we found the time to eat, drink, mingle with guests and dance the night away. They managed to provide us with our day exactly how we wanted it. I would do it there all over again if I could. We always wanted a small intimate wedding, and decided to have one, with about 70 guests, most of them family members. So we opted for a semi-plated dinner. We saw a couple of venues before deciding for the Admiral’s Landing at the Excelsior. When I saw the venue, and the view that could be seen from the large glass windows I fell in love with the place. Plus we have always heard positive comments about the place, especially the food!! The Staff was all so very helpful. Even the florist said that she never found the co-operation she found at the Excelsior for assistance to bring in the flowers on our special day. 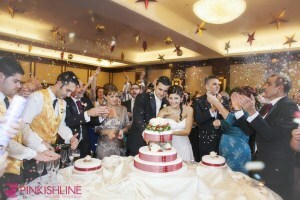 We couldn’t expect anything more, the layout of the place, the cake table, the guests’ tables………everything was perfect. We had the Admiral’s landing exclusively for us, so we were very comfortable, although the children were all running around but it was our choice to have children at our wedding!! The food was excellent, from the soup, to the starter and main course and desert. Everything was fabulous!!!!! All our guests were completely satisfied, and my family in the catering business and most of them are chefs, but all gave their thumbs up for the food!! The waiter service was excellent as well, they were all very very helpful, with all of us and everything ran smoothly. A big thank you as well to the pastry chefs. The wedding cake was awesome and delicious. I showed them a picture of how I wanted the cake to be, and they managed to do it exactly the same. Thanks again to all of you, we couldn’t ask for anything more. You can rest assured that we would definitely recommend the venue for a wedding… in fact we already did!! Thanks and Regards, Charlene and Luke. Firstly we decided to visit the Hotel a couple of months before our wedding, because in the pictures it looks really amazing. When we were there we confirm that the Hotel is amazing, good locations, views, service. But above of all we decided to organize our wedding there because the attention we received from the first email we sent. The expectations were met, above the level, we are really thankful with all the staff, the beverages and the food was great. The most memorable was the welcome drink and cannapes we had besides the pool with the sunset as background and all the guests enjoying local wine. Our families were really surprised and amazed with the view and the hotel, people came from Mexico only for the wedding and also from The Netherlands and Dublin. 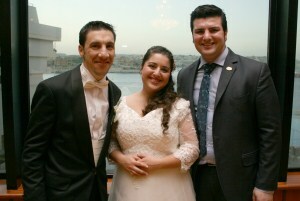 Our guests were a mix of cultures and all of them agree that was a great wedding, the food, staff and view were great. I will recommend the Grand Hotel Excelsior without a doubt. Kind Regards, Francisco Javier and Relana. At first, when we were looking for our wedding venue to celebrate our wedding day, a hotel was certainly not on our list. After visiting a couple of venues, we couldn’t find what we were looking for. One day my father recommended viewing a wedding at the Grand Hotel Excelsior, and we decided to go. It was spectacular! We weren’t part of the reception and we could tell that it was different and sublime. This had to be our wedding venue! To cut a long story short, we met with Neil, the marketing manager for the first time, and he guided us on the best way forward to organizing our big day. From the first day we met with Neil to the last good bye with Trevor, the purchasing manager, everyone was extremely helpful and organised. It says a lot about persons who care about their profession as much as these people do. One of the things we were most impressed with was the food. Thus special thanks goes to Roger, the head chef and all his staff. We also have to mention David, the pastry chef and all his staff as well. 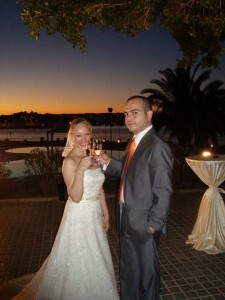 Following the wedding, we received so many compliments, including: excellent food, charming service and superb venue. Everyone dreams of their wedding day and I have to say ours couldn’t have been better! 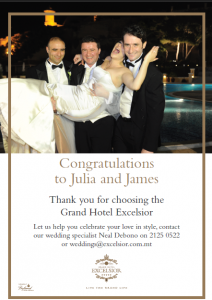 The staff at the Grand Hotel Excelsior was so accommodating and helpful in the run up to our big day that we had absolutely nothing to worry about. They were perceptive, kind and drew attention to every detail. I would highly recommend the hotel for any occasion and thanks again to all the staff for helping have made our day so special and giving us beautiful memories to keep forever! Warmest Regards, Carlo & Annalise.